Sepia tone photograph of bay gelding, pacer Walter Patch warming up with driver Mason up at the Cumberland County Fair Trotting Park during the Western Maine Agricultural Exposition, Gorham, Maine, August 1932. 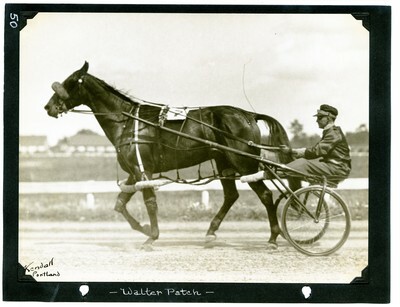 Walter Patch finished third in the 2.22 Pace. The photograph is signed by Guy Kendall in India ink in the lower-left corner.